Retired and wondering what the next chapter in her life held, Rachel Kilbride heeded a calling to buy St. Bridget Catholic Church and turn it into a community center. Staff photo by David Leaming Rachel Kilbride stands on Thursday in the nearly finished interior of the former St. Bridget Catholic Church in Vassalboro. Kilbride and her husband have transformed the building into St. Bridget Center. The building will be available for community events and also can be rented for functions. The first event will be the Senior Services fair on Wednesday. VASSALBORO — On Thanksgiving Day in 1925, the Catholic church in North Vassalboro burned to the ground. Organizations and other churches in the community donated their money and their time to build a new place of worship — St. Bridget Catholic Church — on the same stretch of land on Main Street. St. Bridget’s doors were closed in 2011 along with other area churches as part of parish consolidation. It was left vacant and run-down for four years until Rachel Kilbride came along. 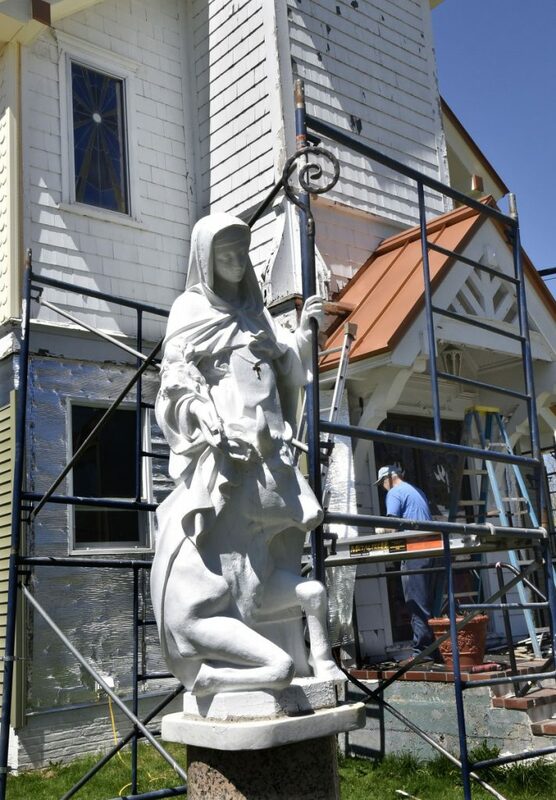 She and her husband, James, have spent the last three years putting a lot of hard work and a lot of money into restoring the former church, and they’re now finally approaching the finish line. 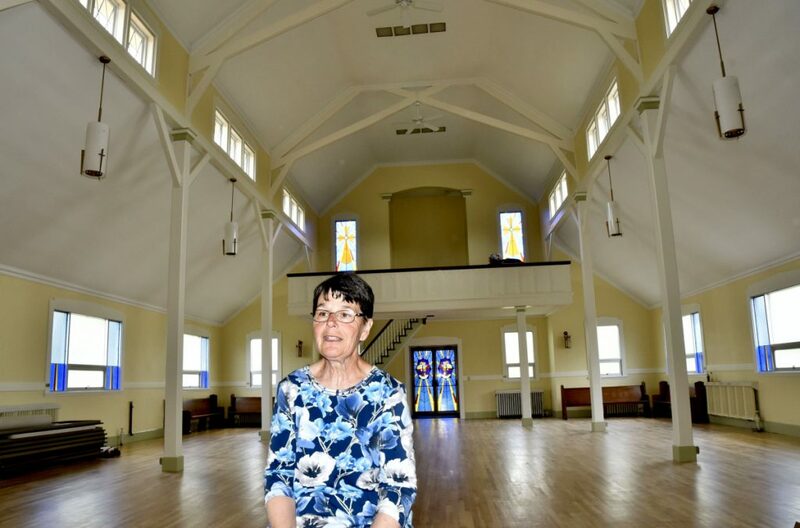 For Rachel Kilbride, that means it’s time to give back to the same community that pitched in to build the church 93 years ago — both by providing a new space for Vassalboro residents to congregate and by preserving a place that holds so many special memories for generations of past parishioners. Last week, Kilbride and her hired crew were still putting some of the final touches on the building, which will now be called St. Bridget Center, but the renovation is essentially complete. The interior — now cleared of the heavy, wooden pews — is bright, open and spacious, with walls painted a muted yellow and the ceiling and pillars a clean white. The floor has been refinished and the stained glass windows have been cleaned and restored to their former beauty. “I’m anxious to see them see how beautiful it is,” Kilbride said of Vassalboro residents during an interview inside the center on a recent afternoon. Four years ago, Kilbride never imagined she would be taking on such a time-consuming and expensive commitment. She was just retiring from a career as a teacher and wasn’t sure what the next chapter had in store. In the spring of 2014, Kilbride was driving through town on the way to visit her parents at their camp at Webber Pond, and as she passed St. Bridget Church, she felt an odd pull toward the building. “A little voice in my head said, ‘Buy me,'” she said. There was no reason to buy the church, Kilbride said. She didn’t even know if it was up for sale at the time. Although she had spent her childhood in neighboring Winslow, going to school at Mount Merici in Waterville, she had been to Mass at St. Bridget only once or twice before. She had no real emotional or spiritual connection with the church, plus she had several reasons not to buy it. “We had a beautiful home,” Kilbride said of her house in Wells, which they sold to help pay for the renovations. Additionally, she had planned on traveling with her husband, now that they both had the time. “I was thinking about taking a trip to Ireland, not to Vassalboro,” she said, shaking her head — still finding humor in the drastic new direction her life has taken. And yet, she couldn’t shake that voice in her head. “It just kept telling me, ‘You need to find out what they’re going to do with St. Bridget’s,'” she said. She remembered that it was a gray, rainy day when she stepped inside the building for the first time since it had closed. It was going to be a monumental undertaking. But in January 2015, the Kilbrides closed on the church, parish house and more than acre of property. The couple first fixed up the parish house, where they now live. Then they went to work on the church, uprooting the bordering trees and shrubs, putting on a new copper roof, remediating the mold, removing the pews and confessionals, replacing the windows in the cellar, painting on coat after coat of fresh paint — 150 gallons’ worth. They also installed new electrical wiring and plumbing and made the building handicapped-accessible. “It was really a diamond in the rough,” Kilbride said. 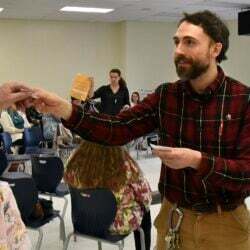 They poured nearly all of the money they had saved into the renovation and put in a lot of hours of hard work, but Kilbride has an immense admiration for the nearly finished product. In the morning, she said, the light streams in through the stained glass and makes a mirror image on the walls, and in the evening the setting sun casts strands of hazy yellow light onto the walls through the windows below the ceiling. Kilbride said the building will be ready when it holds its first event — a senior services fair — this Wednesday. The Kilbrides will be putting it on free of charge for the town. They also will hold an open house from 1 to 3 p.m. June 10 for the public to come in and see what they’ve done with the old church. At the fair she hopes to display an album of old photos from past parishioners, showing how the church used to look. Soon, she said, they will be able to rent the space for events. Also, she plans to host a monthly sewing group to raise money for local charities. More than three years after closing on the church, Kilbride says this is the biggest leap of faith she’s ever taken. 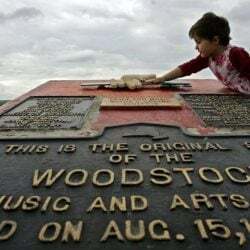 But along the way, there have been all these little, random signs that have made Kilbride believe the massive undertaking was what she was meant to do. Some of them were silly flukes, such as the fact that her granddaughter also is named Bridget. Some signs Kilbride has found religiously symbolic. For example, it has taken exactly 40 months — 40 being a number used throughout the Bible to signify a time of tribulation — from the time she and James purchased the property to now to finish the renovation. Other signs have been oddly coincidental. The day Kilbride called the diocese to see what was going to be done with St. Bridget, the pastor told her it wasn’t yet up for sale, but said he was going to call the bishop the next day to see if he could put it on the market. And some signs have been completely unambiguous. Parishioners have been sending letters since she began the project, explaining how much the church meant to them growing up, how their parents had gotten married there or they had cherished memories of their father leading the choir. Some former congregants, including one of the church’s former priests, were in tears when they stopped by to see the renovation.